Greetings again from the darkness. Space … the final frontier. Or is it just another political football? Director Paul Hildebrandt examines the space program from all angles: past, present, and future. He enlists experts such as Astronauts Jim Lovell and Story Musgrave, physicist and author Michio Kaku, Astrophysicist Neil deGrasse Tyson, Norman Augustine (Chairman of the Review of the United States Human Space Flights Committee), and numerous politicians, journalists, and former NASA staffers. Passionate opinions and perspectives fill the run time, as do frustrations and hopes. Viewing the space program as a marketing campaign to the American public, Mr. Tyson is especially outspoken when he states that the economic and cultural benefits of a true scientific program are beyond argument. GPS and the internet are but two of the transformative developments courtesy of the space program, and proof enough that a more scientific approach could lead to even more discoveries. Instead, it’s pointed out that no scientists were included in the Apollo missions until Apollo 17, the final Apollo mission to the moon with astronauts. This occurred after the significant budget reduction in 1970 that cancelled a couple of Apollo missions, setting the stage for the program to end. 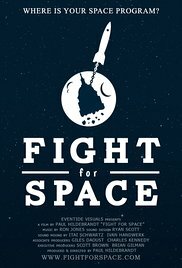 Discussions and criticisms of the Space Shuttle program (described as driving trucks in circles), the Space Station (a $150 billion program with no purpose), the Mars Direct proposal, and the Constellation Program (started by George W, cancelled under Obama), are each given attention and insight. Perhaps it’s all best described by Jim Lovell who states the Russians are the tortoise in the race, while the U.S. simply gave up. Very few events match the breathtaking majesty of a rocket lift-off. The beauty and power of this engineering marvel generate the wonderment of exploration and discovery. Sadly, most of the triumphs and tragedies of the U.S. space program are little more than entries in a textbook (or website) for today’s kids. The program lacks leadership and vision, and the case can be made that the only hope is with the private sector (such as Elon Musk). The final 10-12 minutes of the film is really a pep talk (Sales pitch? Propaganda?) for an actual scientific space program. This time, let’s hope that rather than political reasons, we go because it’s there! This entry was posted on Wednesday, May 17th, 2017 at 5:43 pm and is filed under Documentary. You can follow any responses to this entry through the RSS 2.0 feed. You can leave a response, or trackback from your own site.